When Shantae is awoken by a mysterious voice, she learns that she is the only person capable of putting a stop to an evil that threatens to plunge the world into darkness. In her biggest, most beautiful adventure to date. the 'Half-Genie Hero' will explore distant lands and discover countless secrets in order to save the world from impending doom. When I think about Wayforward's library of games, it largely of games that are beautiful and rich in imagination, but often stumble with the execution of their sometimes lofty ideas. 'Shantae', however, has always been the series of theirs that I've loved the most, and while they weren't immune to the studio's fairly common pitfalls, the basics in each entry in the series have been so strong that all of my issues with them ultimately ended up feeling like minor gripes. 'Half-Genie Hero' might have some of my biggest issues with the franchise to date, but it's all wrapped up in such a delightful package that I couldn't help but enjoy myself playing it. 'Half-Genie Hero' never makes it clear exactly where it fits in the series canon, even joking about how it's not really a reboot, sequel, or remake. It never matters all that much, telling a breezy little story that doesn't expect its audience any familiarity with previous games save for a few small in-jokes. 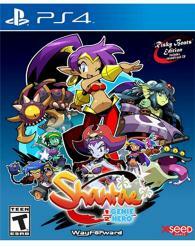 Shantae is a half-genie who works as a protector of Scuttle Town, assisting her uncle with the creation of a device that should permanently protect the town while venturing to other lands to fight pirates and other menaces. It's pretty much entirely a vehicle for comedy, with a frequently witty and extremely charming script that perfectly understands how to make its characters endearing and fun be around. Gameplay-wise, there's plenty here that's been brought over from previous entries in the series, but it's also undergone some fairly big structural overhauls. 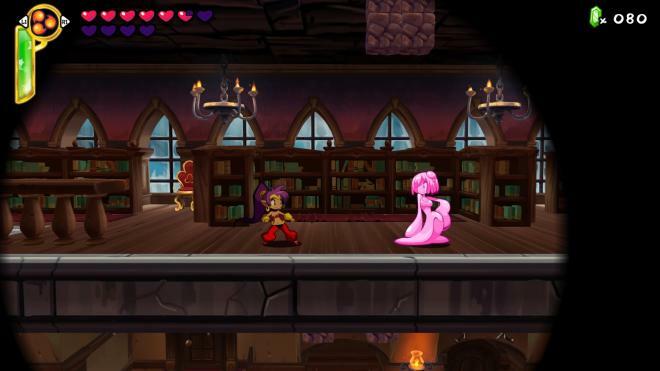 An exploration-based platformer, 'Shantae' sees players seeking out hidden items and upgrades that give the titular genie a variety of new techniques that allow her to see more of the game's world. At the outset, Shantae can't do much outside of whipping ing into a monkey lets her scale walls, while becoming a mermaid lets her swim around freely underwater. They're ultimately fairly standard Metroidvania-style upgrades in execution, but seeing all the forms Shantae can take and how they fundamentally alter what she can do is extremely fun. The game has actually shifted away from the more open nature of the worlds in previous games. Where older entries saw you in either one big world that players could largely explore at their leisure, or put them in a series of smaller but still very open islands, 'Half-Genie Hero' goes for mostly linear levels. It's a bit of a double edged sword, as the more focused level design has led to some of the best platforming in the series, but I'd be lying if I said I didn't miss the style of the older entries. 'Pirates Curse', the previous entry, was filled with exciting dungeons to explore that were filled with unique ideas, but 'Half-Genie Hero' feels far more traditional, going as far as to totally eschew having any sort of map. These levels feel a little at odds with the upgrades players can collect, with one upgrade in particular only having being usable once in the entire game. Despite the more linear levels, the game still wants players to explore everything heavily, and it's here where the game is at its worst. Some of the most obscure items in the game need to be found just to progress through the story, and without any sort of map, there are a ton of nooks and crannies that are extremely easy to miss. I was stuck trying to locate a vital item for close to an hour before I made any progress. Simply running through the levels doesn't really necessitate a map, but the addition of one would've made certain parts of the game far more tolerable. When I'd finished the game, I had a 99% completion rate, and without a map, I have absolutely no idea where to even start looking if I want to find the single percent I missed out on. The game also has a surprisingly inconsistent difficulty curve that’s worsened by poor checkpointing. One section in particular was an auto scroller that takes quite a while to get through. Making a single mistake sends players right back to the start of the area, making them do everything all over again. There was a particular two-phase boss very early on where dying in the second section of the fight forces players to restart from the first phase, which hurt particularly badly considering that I had no health upgrades at this point in the game. After those two sections, I ended up breezing through the rest of the game, reducing many of its bosses to simple damage sponges where I never felt like I was in any danger. The difficulty and lack of map are easily the biggest stains on an otherwise lovely game. 'Shantae' is frequently beautiful to look at, swapping out the sprites of older entries for hand-drawn 2D models. Simply watching characters move around is an absolute joy, with Shantae herself being given a ton of flair that turns her every action into something of a dance. Even when the bosses stumbled in terms of gameplay, it was a joy to see their visual design. Each level is also packed full of small touches that makes this one of the most artistically lovely games of the year. Sadly, some of the 3D environments look a little basic and feel at odds with the 2D art, but the sheer beauty of the majority of the game makes that a small blemish at most. 'Half-Genie Hero' isn't a particularly long game. Collecting just about every item, I finished in just over 7 hours, without item hunting, the game should take around 5 hours. 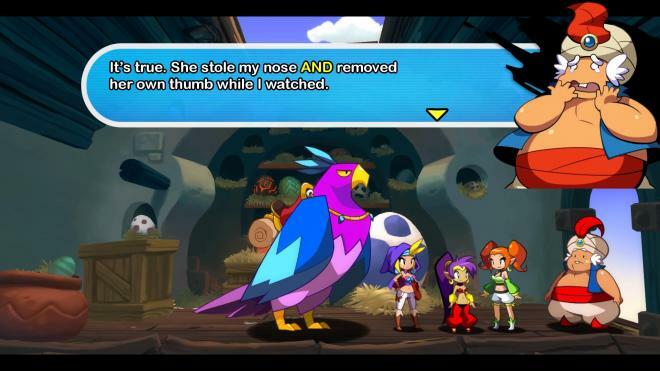 As of now, there isn't a ton to dive back into the game for outside of shooting for all the items in the game and a new game+ that allows players to start with plenty of the upgrades in the game, but Wayforward will be adding free DLC in the near future that adds new playable characters each with their own stories, as well as new unlockable outfits that change Shantae's stats and movesets. 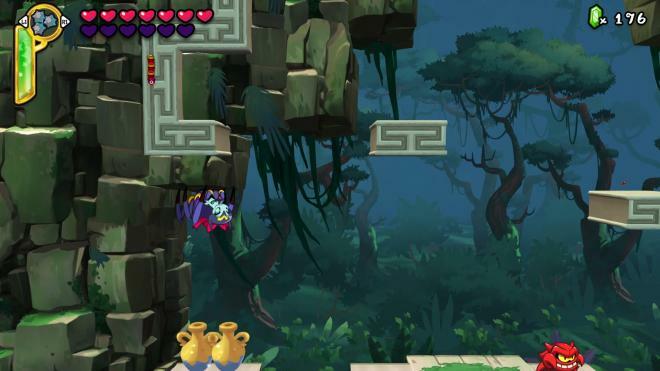 The shift to more linear level design can definitely sting, particularly in the moments where the game still encourages exploration without providing any sort of map, but the platforming here is terrific, and 'Half-Genie Hero' is filled with boundless charm that makes it a delight to experience, with art and music that are an absolute joy to behold. While the game is light on extra content right now, the promise of free DLC that will expand the game dramatically could easily lead to this being the biggest 'Shantae' yet. It might not be the half-genie's best adventure to date, but it's an upbeat, extremely fun game that's well worth checking out for anyone who likes platformers.